DNA methylation is recognized to play a major role in a number of cellular functions such as embryonic development, genetic imprinting, X chromosome inactivation and the control of gene expression. DNA methylation is generally associated with transcriptional repression. DNA (cytosine-5)-methyltransferase1 (DNMT1) preferentially methylates hemi-methylated DNA, in a CpG context, to maintain the methylation pattern in the new strand of replicated DNA..
Full-length human recombinant DNMT1 (residues 2-1616 (C-terminus); Genbank Accession # NM_001379) expressed in Sf9 insect cells with an N-terminal His-tag and a C-terminal Flag-Tag. The molecular weight of the protein, including the His-tag and Flag-tag is 182 kDa. 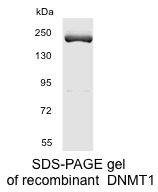 Each lot has been evaluated by 10% Tris Glycine SDS-PAGE mini-gel. 20 μg recombinant DNMT1 protein supplied at a concentration of 0.5 μg/μl in 20 mM Tris-HCl pH 7.5, 150 mM NaCl, 100mM EDTA pH 8, 0.01% NP-40, and 10% glycerol. Recombinant proteins in solution are temperature sensitive and must be stored at -80°C to prevent degradation. Avoid repeated freeze/thaw cycles and keep on ice when not in storage. This product is guaranteed for 6 months from date of receipt. Products guaranteed stable for 2 years from date of receipt when stored properly.